If you’re thinking of building a barn, garage, or workshop on your property in Edmond, OK, look no further! D Cross Barn Co. is experienced in all types of construction, and we would love to build that barn for you! 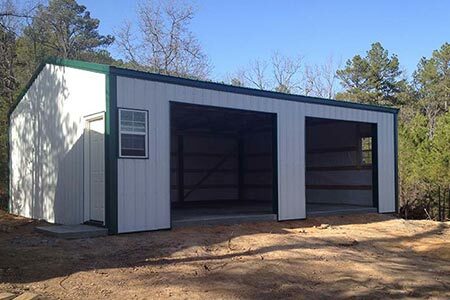 D Cross Barn Co. has over 20 years of experience constructing post frame buildings. Post frame buildings are wood frame structures with posts for piers which allow you to build on unlevel ground. This means we can construct your barn where you need it most! These buildings are sturdy and long-lasting, and they enable you to design them to fit your needs. We also make them visually appealing, so they will add to, not take away from, the beauty of your landscape! Whether you want your barn to look exactly like your neighbor’s or you prefer a unique barn design, we can custom build it just the way you want! We offer many custom features such as skylights, windows, cupolas with optional weather vanes, insulation, and concrete floors and walkways. Select the look and the colors that are just right for you and your landscape! We offer warranties on our buildings and choose high quality materials for all our construction projects. Depending on weather and the complexity of the building, the actual construction only takes a few weeks, and sometimes only a few days! D Cross Barn Co. has excellent references available upon request, and we would love to help you construct the next barn building on your Edmond, OK, property!